Wet bottom ash hoppers may have a dirty job, but don’t let that fool you when it comes to how important this component is for a steam generating, coal-fired boiler. These water-filled hoppers are used to collect ash and slag, which are by-products of burning coal. A steam generating boiler simply cannot operate without an ash hopper. The No. 1 reason for ash hopper failure is improper material selection or application. A properly installed ash hopper lining should last up to 10 years. Unfortunately, the average ash hopper lining today lasts only about 5 years, costing the power industry thousands of dollars in lost revenue. This article provides need-to-know information about this vital component. As described, a wet bottom ash hopper is a water-filled steel tank with a protective lining used to collect bottom ash and slag from a steam-generating boiler that uses coal as its main source of fuel. It can be in the shape of a V, or it can be a multileveled, flat-bottom type. The number of hoppers required will depend on the size of the boiler and the amount of storage capacity required. Each V-shaped section or flat-bottom level usually has a separate discharge to remove the slag and ash collected within the ash hopper. Two types of ash fall into a wet bottom ash hopper: coal ash and slag. Coal ash is the residual product left after burning of the fuel and slag, which is the formation of molten, partially fused, or re-solidified deposits on the furnace walls inside the boiler. The coal ash and slag fall into the water-filled ash hopper from the furnace above. This is emptied by opening a gate that allows the slag, ash, and slurry mix to flow into another watertight chamber. The ash, slag, and slurry mix is made up of various-size chunks of ash and slag. It passes through a grinder or crusher and onto a conveyor belt to be transported to a designated landfill. Water is used to fill the ash hopper to make it possible to remove the ash and slag, and cool the exposed ash-hopper lining from the radiant heat coming from the furnace area above. The ash hopper is filled to a certain level, and the exposed upper portion of the ash-hopper lining must be water cooled. This is done by a water curtain arrangement at the top of the ash hopper that allows water to continually run over the surface of the lining material. The ash-hopper lining is made of brick or refractory, or a combination of the two, and is used to protect the ash-hopper plate. The slag, ash, and slurry mix content can be very corrosive to the lining materials because of the surface porosity of the lining material. The slag, ash, and slurry can penetrate the surface of the lining and cause its deterioration. Some steam-generating boilers require refractory inside the lower furnace area to protect the furnace water wall tubes from ash and slag created by the burning of fuel (such as coal, biomass, and black liquor). The refractory material used inside a furnace must be slag resistant and must have proper thermal conductivity to assist in the formation of a “frozen” layer of slag between the refractory surface and the molten slag. This thin slag layer is formed by the interaction of several factors—the cooling action of the studded furnace tube walls, the thickness of the refractory material, and the thermal conductivity of the refractory material. Inside wet bottom ash hoppers, however, no such frozen layer can exist to protect the refractory from the corrosive action of the combination of slag, ash, and water found inside the ash hopper. Unlike the furnace area of a boiler, a wet bottom ash hopper lining must contend with the type of water being used to fill the ash hopper. Most power plants are located near a river and use river water to fill their ash hoppers. It has been found that when the phosphate levels of river water begin to approach 8 percent or greater, a chemical reaction can occur between the water pH and the lining material. To choose the right material for use inside a wet bottom ash hopper, one should consider that the lining material has to withstand the pH in the water and take into account the chemical makeup of the slag and ash that will fall into the ash hopper. 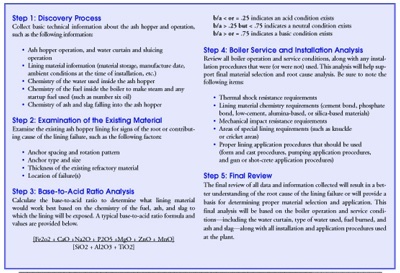 A typical wet bottom ash hopper analysis would involve the steps highlighted in Figure 1. Loss of water curtain above the water line. Loss of the water curtain can cause the surface of the refractory (usually about 1 inch thick) to pop off in sheets. This is due to rapid temperature changes in the lining materials’ surface. Improperly sized, spaced, or rotated anchors. Anchors should be sized at 2/3 or 3/4 of the total lining thickness, with one of the two tines or legs of the anchor longer than the other. Refractory anchors also should be spaced evenly in a staggered pattern (for example, 9- x 9-inch staggered centers) with each row of anchors rotated 90 degrees. This will help prevent the creation of a potential shear plane. Mechanical failure. An example of this is large slag deposits falling into the ash hopper. Expansion failure. This can including improperly installed lining or anchors, or choosing the wrong materials. To choose a new lining material or understand why a lining failed, one must follow certain steps, such as those previously discussed in “Understanding Refractory Failure” (see the August 2006 Insulation Outlook). An ash hopper is a collection area for ash and slag, and does not contribute to a boiler’s efficiency or energy savings. However, ash-hopper failure requires a boiler to be shut down. A complete ash-hopper replacement (including the plate and lining material) can be expensive and time-consuming. Complete replacement of an ash hopper can cost as much as $500,000 and take a month or more to complete. Only by following proper lining material selection, handling, and installation procedures can one prevent a lining failure and keep an ash hopper in operation. The longer a hopper is in operation, the longer a boiler makes money. It clearly pays to pay attention to wet bottom ash hoppers.